Residential towers, multi-housing developments and hotels rely on Wausau for our smooth operating, dependable performance and attractive design. Our flexible configurations frame views of the Great Lakes, state capitols, national monuments and more. 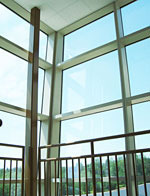 In the Southeast, hurricane impact-resistant window systems protect occupants and staff. In the Northeast, replacement windows blend historic style with modern performance. In the Midwest, its systems keep the cold out, while in the Southwest, it guards against the heat. And in the hotspots of California, it holds up to demanding seismic and energy codes, as well as aesthetic scrutiny.